Wizard and Glass is a fantasy novel by American writer Stephen King, the fourth book in The Dark Tower series, published in 1997. Subtitled "Regard", it placed fourth in the annual Locus Poll for best fantasy novel. The novel begins where The Waste Lands ended. After Jake, Eddie, Susannah and Roland fruitlessly riddle Blaine the Mono for several hours, Eddie defeats the mad computer by telling childish jokes. Blaine is unable to handle Eddie's "illogical" riddles and short-circuits. The four gunslingers and Oy the billy-bumbler disembark at the Topeka railway station, which to their surprise is located in the Topeka, Kansas, of the 1980s. The city is deserted, as this version of the world has been depopulated by the influenza of King's novel The Stand. Links between these books also include the following reference to The Walkin' Dude from The Stand on page 95, "Someone had spray-painted over both signs marking the ramp's ascending curve. On the one reading St. Louis 215, someone had slashed watch out for the walking dude", among others. The world also has some other minor differences with the one (or more) known to Eddie, Jake and Susannah; for instance, the Kansas City baseball team is the Monarchs (as opposed to the Royals), and Nozz-A-La is a popular soft drink. The ka-tet leaves the city via the Kansas Turnpike, and as they camp one night next to an eerie dimensional hole which Roland calls a "thinny", the gunslinger tells his apprentices of his past, and his first encounter with a thinny. At the beginning of the story-within-the-story, Roland (age fourteen) earns his guns—an episode retold in the inaugural issue of The Gunslinger Born—and becomes the youngest gunslinger in memory. He did it because he discovered his father's trusted counsellor, the sorcerer Marten Broadcloak, having an affair with his mother, Gabrielle Deschain. In anger, Roland challenges his mentor, Cort, to a duel to earn his guns. Roland bests his teacher, and his father sends him east, away from Gilead, for his own protection. Roland leaves with two companions, Cuthbert Allgood and Alain Johns. Soon after their arrival in the distant Barony of Mejis, Roland falls in love with Susan Delgado, the promised "gilly" of Thorin—the mayor. His love for Susan Delgado clouds his reasoning for a time and nearly results in a permanent split between him and his previously inseparable friend Cuthbert. He and his ka-tet also discover a plot between the Barony's elite and "The Good Man" John Farson, leader of a rebel faction, to fuel Farson's war machines with Mejis oil. After being seized by the authorities on trumped-up charges of murdering the Barony's Mayor and Chancellor, Roland's ka-tet manages to escape jail with Susan's help, destroy the oil and the detachment Farson sent to transport it, as well as the Mejis traitors. The battle ends at Eyebolt Canyon, where Farson's troops are maneuvered into charging to their deaths into a thinny. The ka-tet also captures the pink-colored Wizard's Glass, a mystical, malevolent orb or crystal ball from the town witch, Rhea of the Cöos. The globe had entranced Rhea so much that she was starving herself and her pets to death because she spent every free moment watching the visions in the orb. The glass then shows Roland a vision of his future, and also of Susan's death (she is burned as a harvest sacrifice for colluding with Roland). The visions send him into a stupor, from which he eventually recovers—at which point the glass torments him with other visions, this time of events that he was not present for but nonetheless shaped his fate and Susan's, such is the nature of the Wizard's Glass. Thus Roland's sad tale comes to a close. In the morning, Roland's new ka-tet comes to a suspiciously familiar Emerald City. The Wizard of Oz parallels continue inside, where the Wizard is revealed to be Marten Broadcloak, also known as Randall Flagg, who flees when Roland attempts to kill him with Jake's Ruger and narrowly misses (Flagg has bewitched Roland's own guns, saying, "Only misfires against me, Roland, old fellow"). In his place he leaves Maerlyn's Grapefruit, which shows the ka-tet the day Roland accidentally killed his own mother. Roland, it has been explained time and again, tends to be very bad medicine for his friends and loved ones. Nonetheless, when given the choice, Eddie, Susannah and Jake all refuse to swear off the quest; and as the novel closes, the ka-tet once more sets off for The Dark Tower, following the Path of the Beam. Readers of the uncut version of The Stand may be confused by the dates given in the book. 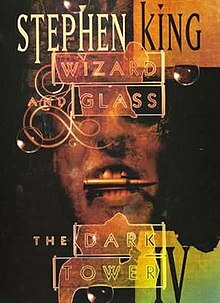 The uncut edition takes place in 1990, while Wizard and Glass brings the ka-tet to that world in 1986. When The Stand was first published, it took place in 1980. It may be said that this is "another when" than the novel The Stand, as pointed out by Roland. "There are other worlds than these"
Dave McKean created eighteen Illustrations for The Dark Tower IV: Wizard and Glass. The original eighteen illustrations appear only in the first edition hardback released in 1997. All subsequent trade paperback editions of the novel only feature twelve of McKean's illustrations; mass market paperback editions do not feature any. This page was last edited on 5 October 2018, at 17:50 (UTC).